There is a new Marco Polo cruise terminal on the east side of the harbor in the downtown area of Brunswick. The downtown area is walkable although there are some hills. There is additional cruise docking at The Diamond Jubilee Cruise terminal next door and at Long Wharf which is further into the harbor and also in the downtown area. You can walk on the harbor Passage from both cruise docking locations to the Reversing Falls. Taxis in Saint John are not metered. There is a zoned fare system--be sure to ask how much the ride will cost. Another quirk of this taxi system is that you do not necessarily have exclusive use of the taxi. The driver is allowed to pick up and drop off another fare while you are in the taxi. Pick up a map at the Welcome Kiosk in the ship terminal. 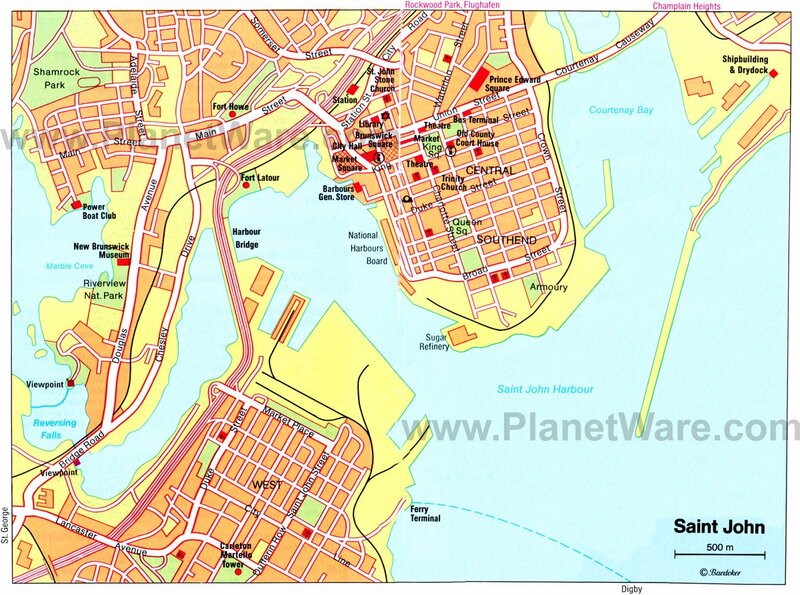 The city of Saint John offers so many events that it is hard to chose where to begin. The Reversing Falls is a one-of-a-kind natural attraction in the heart of the city, where during high tide (which is the highest in the world) the rapids of the Saint John River actually reverse direction. Bus #1 leaves from City Hall but you will need to take #2 for the return trip. St. John is very walkable. The climate controlled Pedway system is easy to follow. The most popular excursion is St. Martin's (50 minutes from Saint John). It is a fishing village that experiences some of the highest tides in the world, and if the excursion is timed properly, you can "walk the ocean floor" and experience a sea cave. St. Andrew's by the Sea (70 minutes from Saint John) is a historic summer resort town with gift shops, museums, galleries and the fabulous 27 acre Kingsbrae Garden. In Saint John, horse drawn trolley tours of the historic area are popular. Thrill seekers should check out the zip lining. Saint John Transit Bus Company offers 2 hour guided tours of Saint John twice daily. The tours run from June 22nd to October 3rd and leave from Barbour's General Store, at the foot of King Street in Market Slip. You may purchase your ticket directly from the driver. Tours begin at 10:00 a.m. and 1:00 p.m. Hop on/off buses: The Big Pink Buses will follow three routes throughout the city: A - All about Town, R - Reversing Falls and T - Top of the Market. Tour tickets purchased are good for all three routes and will run continuously throughout the day. A portion of your fare goes to breast research. $40 for an adult and $30 for a child. There is an Avis car rental is close to the dock. Hopewell Rocks National Park. Part of the Hopewell Rocks experience is a beach walk along the ocean’s floor among the flowerpot-like formations. Due to the extreme tidal range of the Bay of Fundy, the base of the formations are covered in water twice a day. However, it is possible to view the formations from ground level at low tide. What about the zip line at Reversing Falls? Five zip lines, gobs of fun. City Market : the Saint John City Market offers a unique shopping experience for locals and visitors alike. Nowhere else in Saint John can you experience a traditional "farmers market" while shopping for such a wide selection of goods and services. Brunswick Square is a 3-level shopping complex with a wide variety of stores. Canadian dollar, but USD widely accepted even by local transit. The Marco Polo terminal offers free WiFi. Free internet access is available at the Saint John Regional Library at Market Square (near ship) - enter on second level of Market Square then make your way to top of stairs to reference desk to make arrangements. Computer terminals are limited and cruise ship days are busy so you may have to wait.